This was the second time that we had held our weekend at the Hilton Coventry. The previous time was in 2003. The layout of the hotel conference rooms were ideal, with the crèche rooms all being together in a safe area. There were plenty of interconnecting bedrooms for families with two or more older children. Lisa and I stayed on Friday night so we could prepare everything with the help of Beverley, Lisa’s Mum and my son, Kerry. Saturday began with registration from 11am. 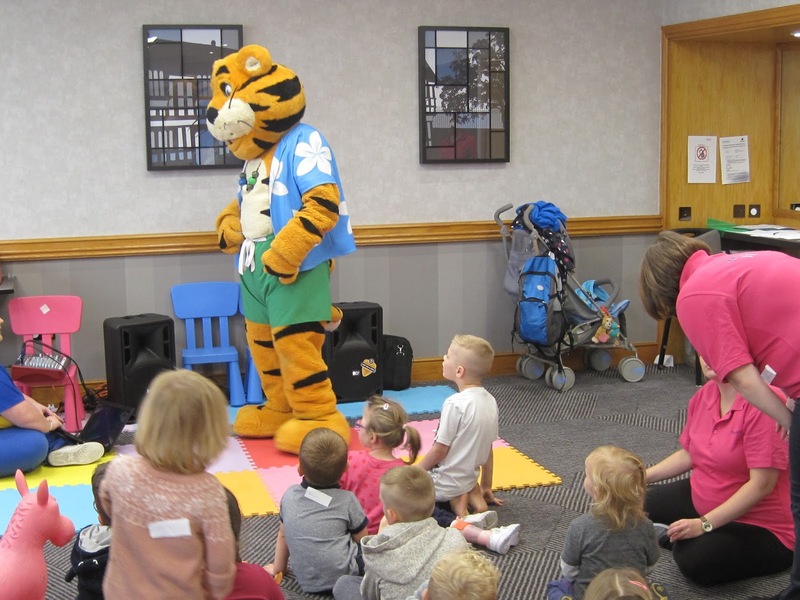 The entertainers from Haven and Butlins were fantastic and occupied the children so families could chat together. After a lovely buffet lunch they entertained the children in the crèche rooms and to the surprise of the children they brought Rory along for a sing song and fun. The children were so excited. A big thank you to Dawn Macey for organising this. Karen Ray, Occupational Therapist was there all day for anyone who had any OT questions around equipment/independence aids. She brought a few small bits such as handwriting equipment and cutlery, as well as some hemi help leaflets and equipment catalogues. After lunch Dr Jenny Sloneem and Dr Imogen Newsom-Davis, Clinical Psychologists from Great Ormond Street Hospital’s Sturge Weber Team, gave a presentation to families on Sturge Weber syndrome and behaviour. Whilst this was going on Dr Gemma Wilson, Clinical Psychologist and Dalia Levy, Assistant Psychologist, ran a teen workshop for young people with SWS. Later in the afternoon Jenny and Imogen ran individual 20 minute behaviour problem-solving drop-in consultation slots for families. While the individual consultations slots were taking place Paula Harman and John Sutton ran a discussion group for families, so they could share their experiences and ask questions. Discussion groups are always popular and families often learn a lot from each other. Thank you Paula and John for organising this. 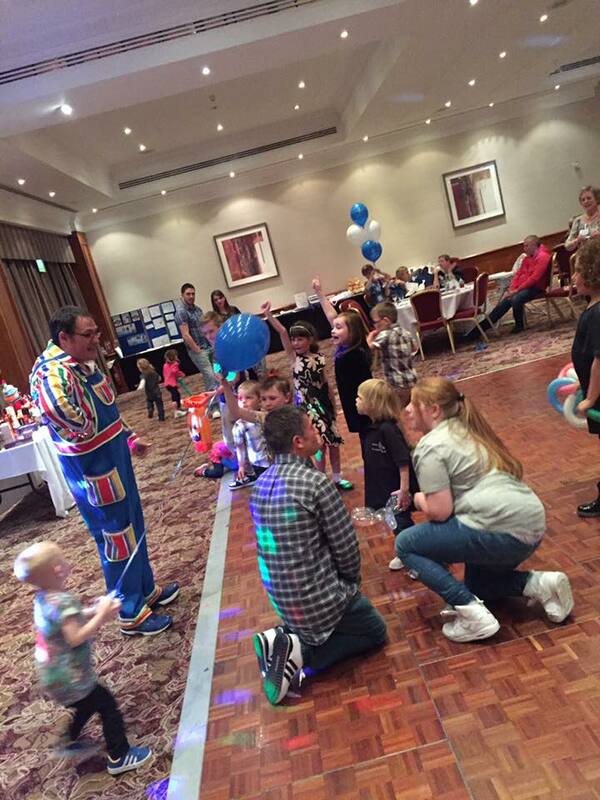 Our evening meal was earlier this year and Mr Whoops entertained the children for an hour and a half before dinner. The children were able to have their meal a little before the Mum’s and Dad’s, in readiness for another hour and a half’s entertainment and disco with Mr Whoops. 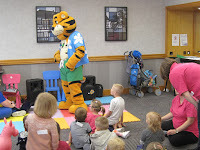 He was a fantastic entertainer and the children had so much fun doing the Conga and playing musical chairs. He was so kind and stayed on after to call out the raffle prizes in his own time. 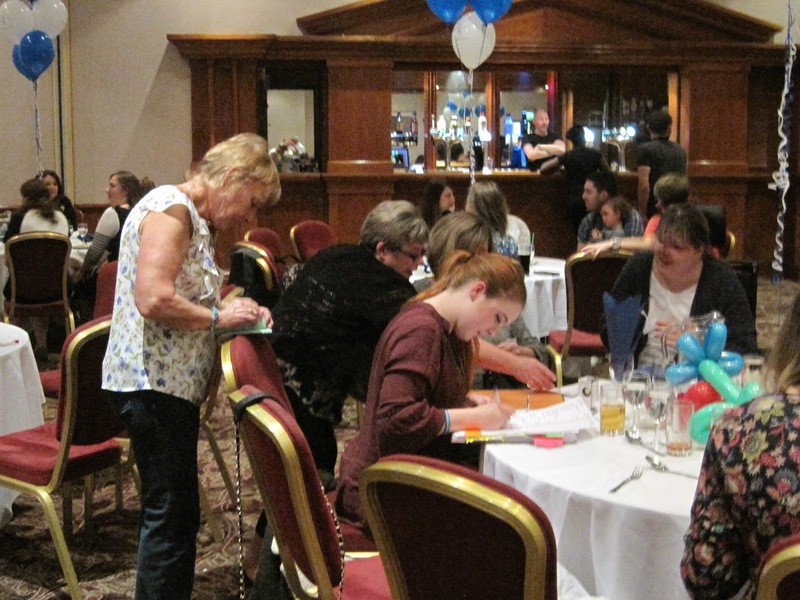 During the evening Elizabeth Chapman, Sarah Howard’s grandma and Beverley Massingham, Angelina’s grandma, kindly went around and sold the raffle tickets. Thank you both for giving up your time and raising a total of £400.05. Thank you to everyone who donated prizes for the raffle. One of Tom Tinsley’s contract managers kindly gave the charity a VIP pass to be auctioned that evening which went really well. Thank you John Sutton for your winning bid of £255.00. Thanks to Kate Husk who won the winning bid for the quilt and cushion donated by Steve Water’s Mum. Steve’s Mum made the quilt which was beautiful, thank you. 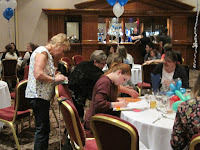 The tables looked lovely on the night with a display of the charity balloons on each table. The children went to bed very tired dragging the balloons behind them. 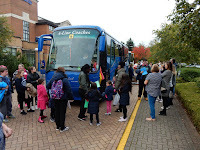 After breakfast some of the children were settled in the crèche and the older ones were organised into groups by Tinies Crèche Company ready for their trip to Conkers. This was the first time that Tinies had cared for our children. 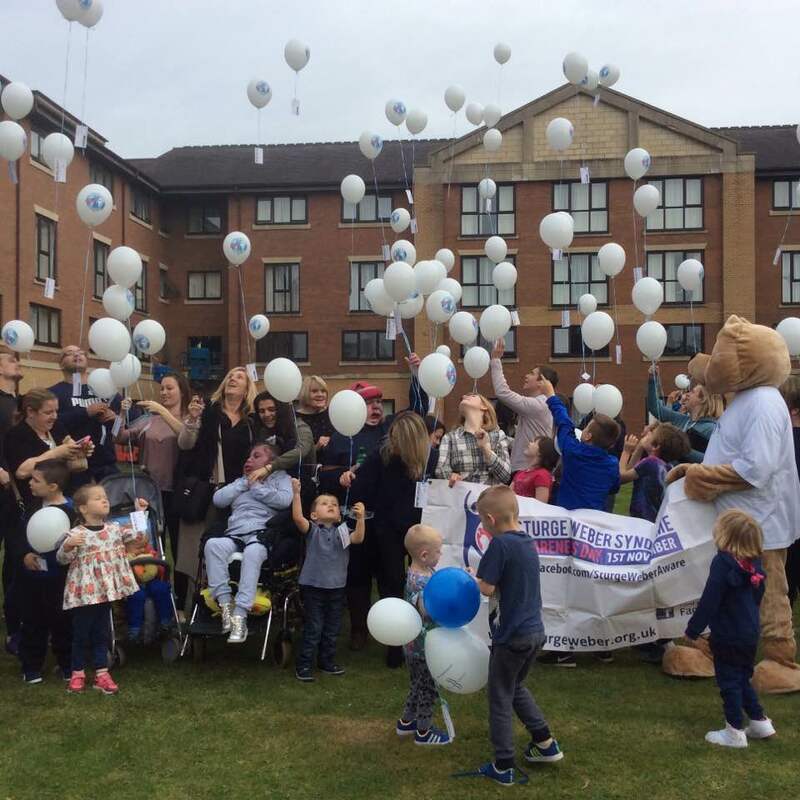 All the nannies were so caring, so families could relax knowing they were in the good hands of Jayne Dainty and her team. We have used A-Line coaches for a number of years now and again they were excellent as they now know our children well. We cannot thank Tinies and A-Line coaches enough for safely taking care of the children. The Conference Day began with the AGM. As the trustees need to be re-elected every three years, it was only Antonia who needed to be re-elected as Treasurer this year. She was proposed by John Sutton and seconded by Paula Harman. This was accepted by everyone. Our first speaker was Mr John Brookes, Consultant Ophthalmologist at GOSH and Moorfields, who spoke about the Complications of Sturge Weber Syndrome and Managing Glaucoma. The second was Dr Samira Syed, Associate Specialist in Paediatrics (Dermatology) at GOSH, who covered the Classification of Vascular Anomalies and Laser Treatment. She was followed by Dr Maanasa Polubothu, Clinical Research Fellow to Dr Veronica Kinsler Paediatric Dermatology, who told us about the Genetic Cause of Sturge Weber and an Update on Current research. Before lunch Hilary Kennedy, Clinical Nurse Specialist Vascular Anomalies and Birthmarks at GOSH, spoke about Care after Laser Treatment. We then broke for lunch which was served in the main restaurant, The Larder. After lunch Dr Sophia Eriksson, Consultant Neurologist from the National Hospital for Neurology and Neurosurgery, spoke about Epilepsy. 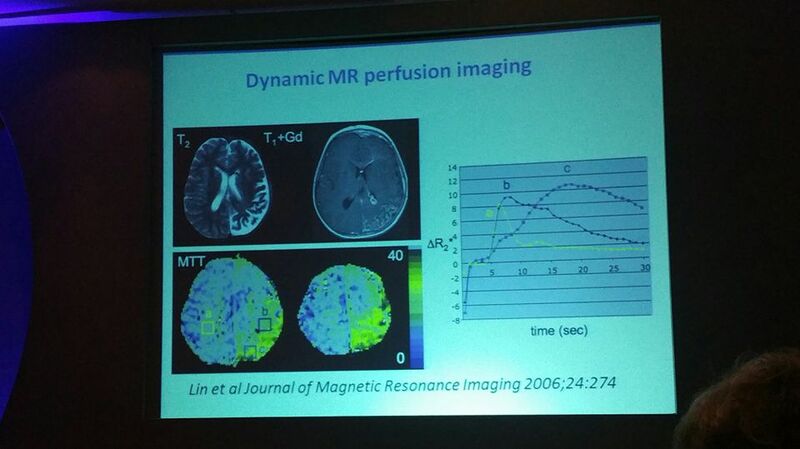 The last speakers of the day were Dr Sarah Aylett, Consultant Paediatric Neurologist at GOSH, who with Emma Ninnis, Epilepsy Nurse at GOSH, talked about Reducing risks in SWS, Managing headaches and MRI perfusion. The conference went well and thanks to Steve Waters who was on hand to make sure there were no technical hick ups. There was time to relax over delicious cake and tea before the children returned from Conkers. The evening began with Non Stop Kids who entertained the children for an hour and a half before dinner. During dinner and afterwards he performed Table Magic for the adults and of course the children enjoyed this as well. Jane Howard had organised some games for the children and as you will see by the photos, adults as well as children had great fun being wrapped up in toilet paper. I think we can all agree we had a wonderful time at the Family weekend last year. Thank you to the committee for organising such an informative and friendly weekend. We put on some games for the children (and adults!) to play on the Sunday evening. Lots of silly things to do to keep the party going a little longer. We played 'Pass the Parcel' and 'Mummy Fashion Show', very messy but lots of fun. 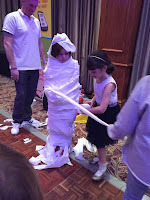 The children had such fun with the toilet roll we didn't get to play any more games! We look forward to seeing you all next year for more fun. If anyone has any great ideas for evening party games for the Sunday evening don't hesitate to let me know. After breakfast on Monday the children were excited and attached their balloon tags, one on each balloon, ready for the balloon race. As it was close to the Charities’ Awareness Day on the 1st November the Awareness Day balloons were released. The children and adults assembled in the hotel garden and on the count of three they were released away up into the sky. Sadly they didn’t reach so far as other years. Danielle Lawton’s balloon went the furthest and was found on a farm on in Bloxham, Lincolnshire almost 100 miles away. Danielle and the finder of the balloon tag received Sainsbury’s vouchers. Isaac Stimpson’s balloon was the next furthest, although only found a few miles from the hotel. Isaac received Tesco vouchers so he could choose some toys that he liked. The person who found the balloon tag also received Tesco vouchers. Apparently the hotel staff were watching as it was the first time they had seen a balloon race at their hotel. I always contact the Civil Aviation Authority to make sure they are happy for us to release the balloons. On this occasion I also had to notify the Council and the Traffic Police the number of balloons we were releasing and the time. Some of you may not have known it was Ben Thow inside the SW mascot bear at the balloon race. We thank him for being talked into doing this for us and I hope he wasn’t too hot. It was then nearly time for lunch. It was lovely that so many families stayed and that some family’s friends who lived nearby joined us. There was still time to relax before saying our goodbyes and heading for home. 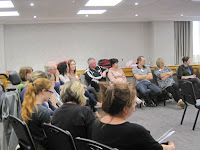 The committee would like to thank everybody who attended the weekend and provided a useful feedback. Last but not least we would like to thank the speakers for giving up their time freely to come and give their presentations and answer questions.